The Fall after the Festival. [caption id="" align="aligncenter" width="460" caption="Third Saturday, September 2016"] [/caption] After another successful unicycle festival we do not put away our unicycles for the season. We still congregate for unicycle meetings and for a few riding events. Above is one of many photos taken that day within the photo album on our Flickr site during the September unicycle meeting. For the month it was the only meting that took place at our usual meeting venue. The first Sunday meeting occurred as part of the unicycle festival. Clicking on any photo in this posting it will take you to the album of the photos recorded at that particular event. So if you have the time click though and check them out. 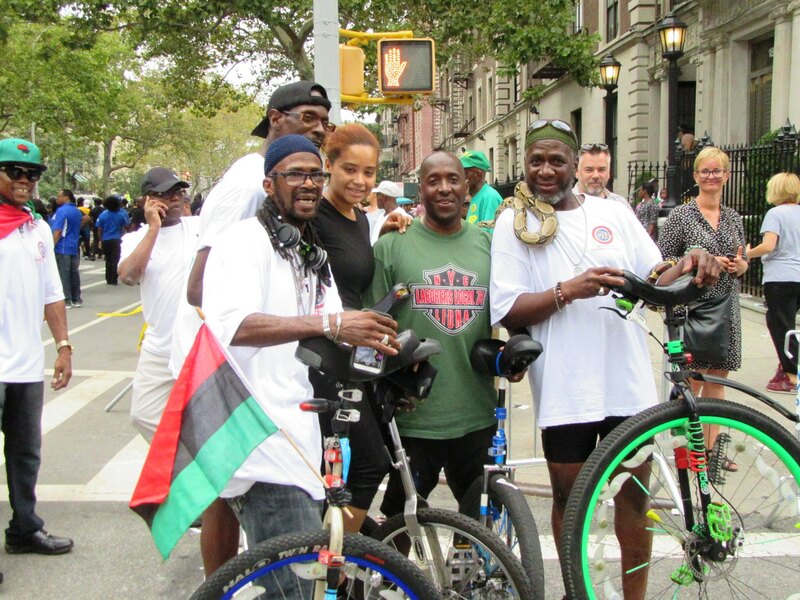 [caption id="" align="aligncenter" width="453" caption="2016 African American Day Parade"] [/caption] On September 18th, the day after the meeting, five of members of the club, John, Calvin, Jerlin, Ken and Abdullah, rode along with the Labor Union Local 79 float up Adam Clayton Powell Jr. Blvd. from 112th street up to 136th street for the 2016 African American Day Parade. We rode our unicycles entertaining the crowd to the music being played by the disc jockey on the float. We had a wonderful weather and a good time in it. As you can see we had unicycles of different sizes and Abdullah even brought along one of his pythons that became the main attraction and attention of the crowd as we rode the parade route. The ride itself is relatively short. However, we basically spend the entire afternoon watching the parade participants and hanging out with the crowd. 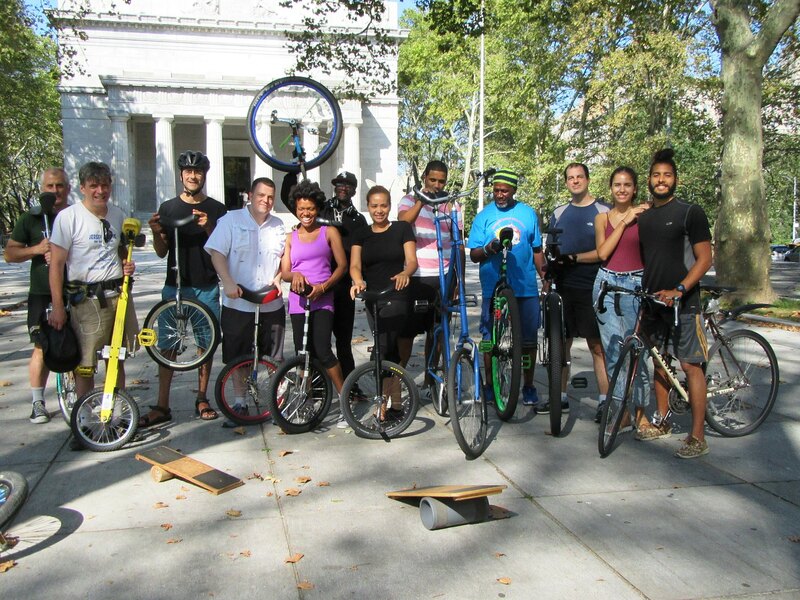 [caption id="" align="aligncenter" width="453" caption="2016 Tour de Bronx"] [/caption] We did have a couple of meetings in October that were not as well attended as the September meeting. You can check out the October album on the Flickr site to see a bit of what went on during those meetings. 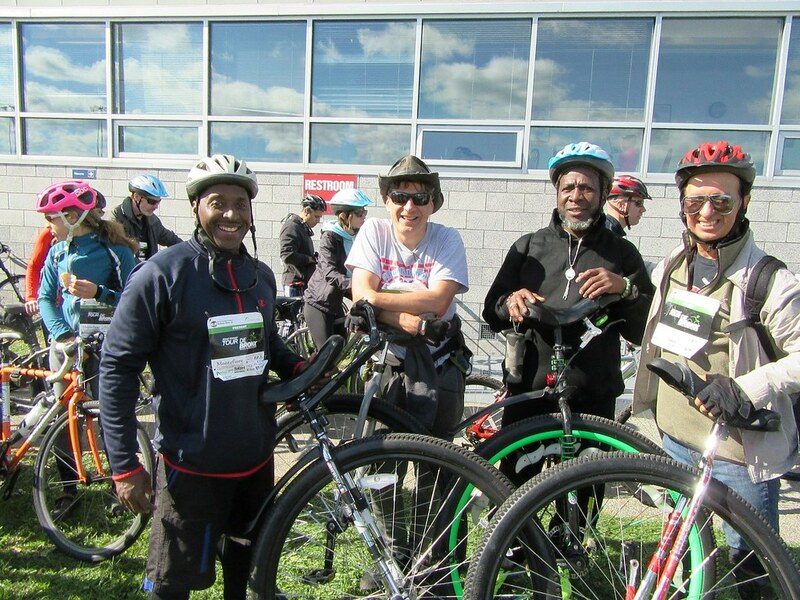 However, On the 23rd of October four of us, Ken, David, Abdullah, and Rodrigo, completed the 25 mile route of the 22nd annual Tour de Bronx. I have to give a shout out to John who started out the ride with us at Harris Park on a 29" unicycle but had to drop out along the route. The tour is a popular well attended cycling ride with thousands of cyclist participating in both the 40 mile and 25 mile routes. The tour is sponsored by Bronx Borough President's office in conjunction with many commercial sponsors. the Current Borough President, Ruben Diaz Jr. actually participates riding the 25 mile route. As you can see in the photo above the four of us all brought along our big 36" wheels to get us safely through the route. The route took us through the streets and the various bike paths through out the Bronx making a few rest stops to fuel up on water, bagels and granola bars. The ride concluded at the Bronx Botanical Garden where there was pizza, energy drinks and a T-shirt waiting for each rider that completed the ride. As always we will continue to meet throughout the coming months. We may even get together for additional rides if we happen to be blessed with nice weather. Come out and visit at one or more of our meetings. If nothing else it will likely get you off the couch and outside to get some air.